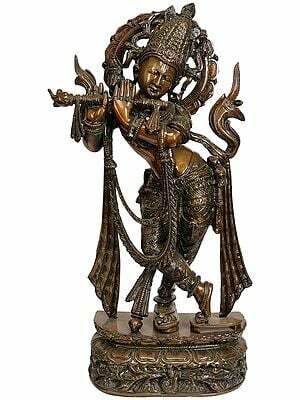 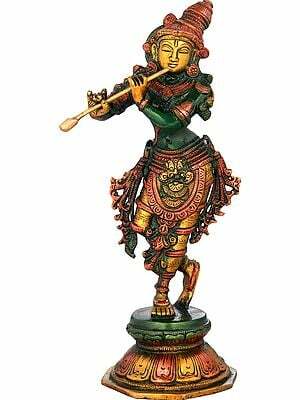 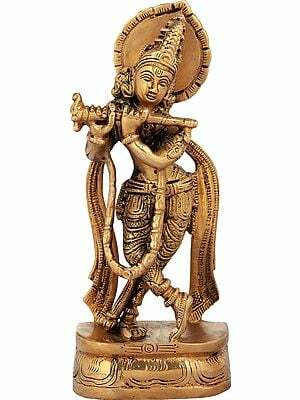 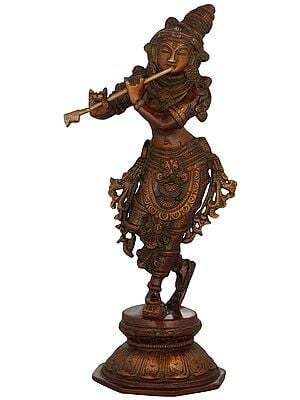 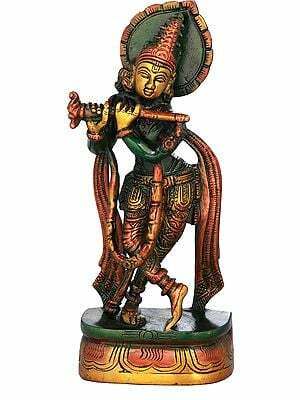 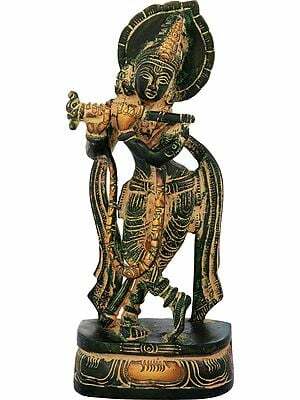 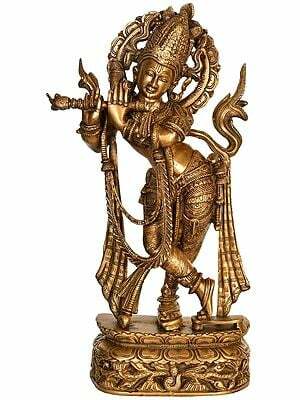 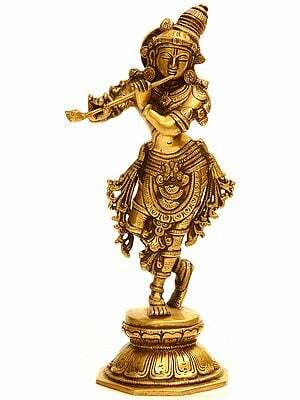 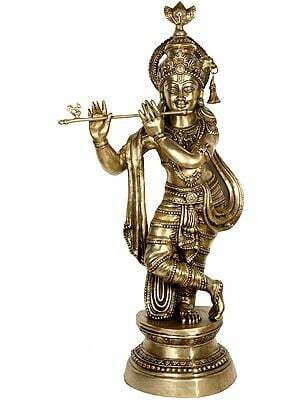 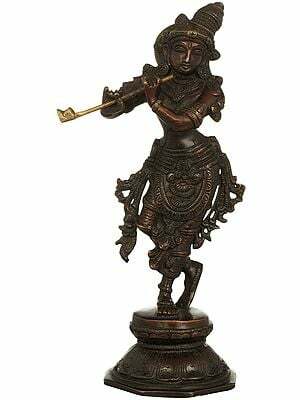 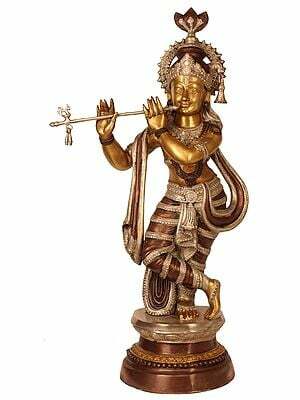 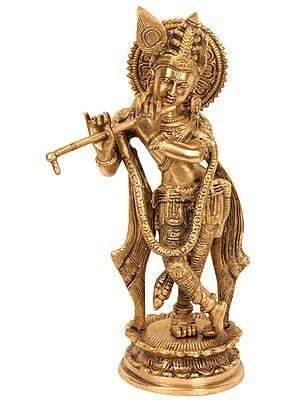 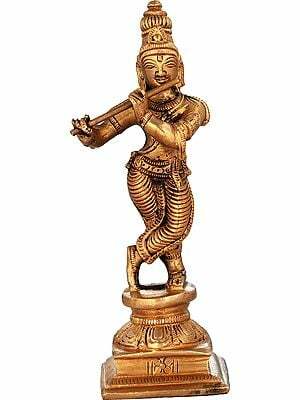 Exceptionally ornate cast in brass, as lustrous and worked with as fine details as an image cast in gold : the same minuteness and precision as define a piece at a goldsmith’s workshop, the statue represents Lord Krishna playing fully absorbed on his flute. 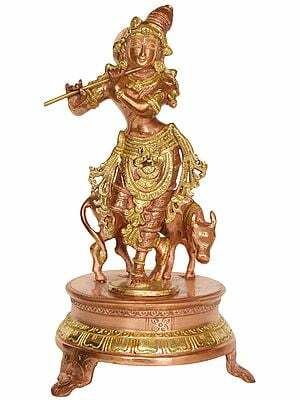 Hearing the melody a cow is drawn to him and stands supporting him from behind. 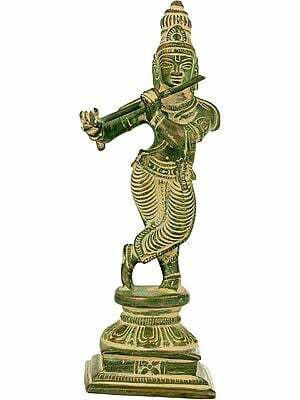 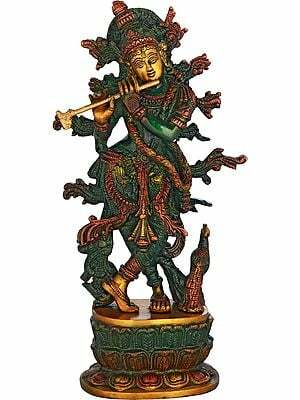 Halebid in the country’s southern part had a highly ornate style of divine images, Krishna’s in particular; however, with a widely different character this image is more akin to north Indian metal casting. 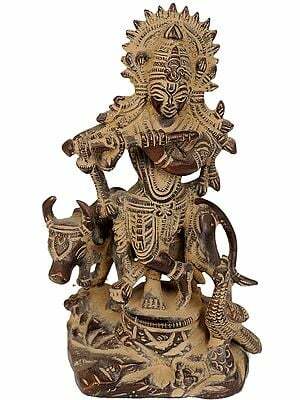 Iconography and anatomy of Krishna’s figure as also the form and features of the cow are characteristically north Indian. 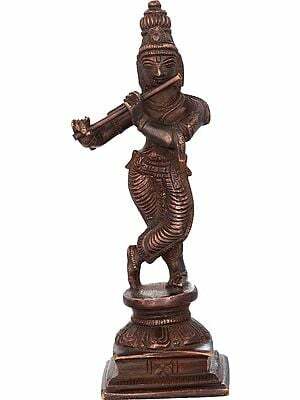 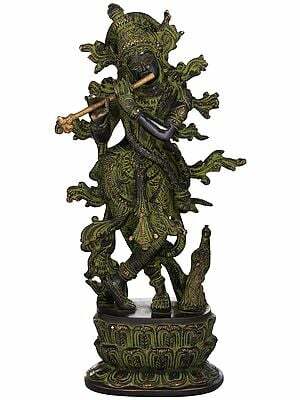 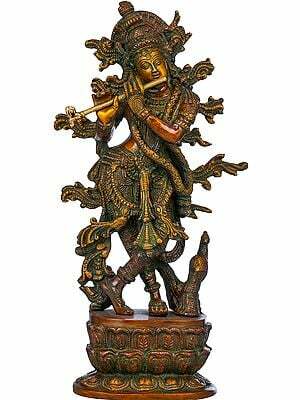 Even the ‘tri-bhanga’ – tri-curved posture is a more celebrated form of Krishna’s images in north. The popular term for ‘tri-bhanga’ being ‘banke’ this form of his image is widely known as Banke Bihari and enshrines the most significant of his ‘pithas’ – seats, the Vrindavana shrine. 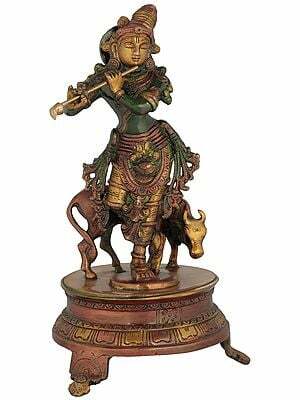 One of the most popular styles of his idol combining two iconographic forms of his image usually named as Venu-Gopal : Krishna playing on his flute, and Dhenu-Gopal : Krishna with cow, an outstanding work of art in regard to representing the essential ‘bhava’ : emotion, absorption of the enrapt Krishna playing on his flute and mystic dimensions of the theme, and the cow’s devotion, the artifact attains its rare distinction in its unique ornate character, great excellence, and power to discover even the minutest details and to inspire devotion. 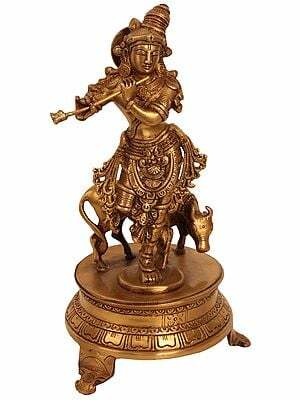 The presence of cow only further enhances his identity as Gopal, a term meaning the patron of cows : ‘Go’ meaning ‘cow’, and ‘pal’, ‘patron’ or ‘keeper’, and thus when combined, the ‘keeper of cows’; however, in Krishna’s relation to ‘cow’ the mystic finds cosmic dimensions. 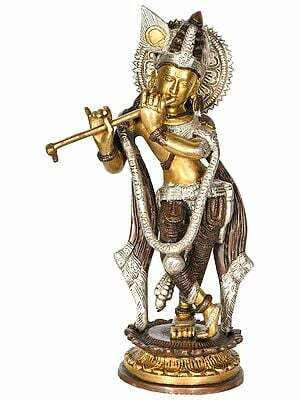 The term ‘go’ also means ‘indriya’ – ‘senses’, the basic character of life and hence symbolic of life, human, animal or nature’s, and hence, the mystic’s ‘Gopal’ is the patron of entire life, ever and everywhere. 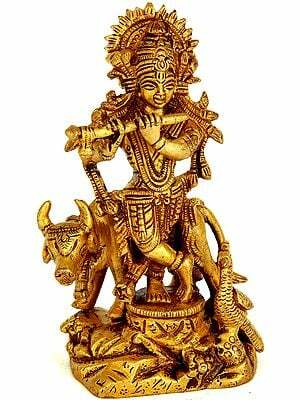 Hence, his identity in his birth as a cowherd is often emphasized by the presence of cow along his image and by adding to his name the term ‘Dhenu’ – cow, ‘Dhenu Gopal’. 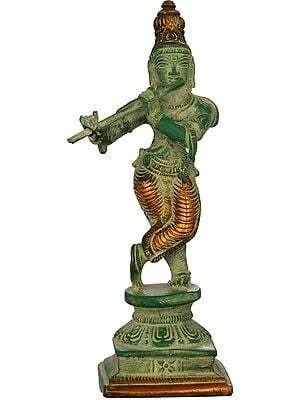 Though not as in South where his images are cast more often like Vishnu’s, the conviction that Krishna is Lord Vishnu’s incarnation has deeply and always influenced his image-form, more so his votive statues in any medium as this brass-cast, if not the illustrative and other kinds of paintings. 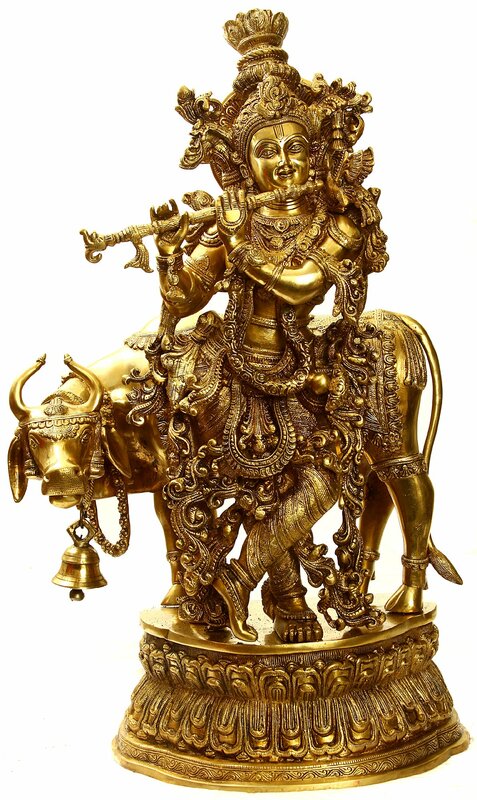 A two-armed image in ‘tri-bhang’ – three-curved posture, playing on his flute and a cow cast along – all essential features of his image, the statue with a number of elements of Vishnu’s icons presents a queer blend of Krishna’s personalized, intimate or rather ethnic aspect and Lord Vishnu’s majesty. 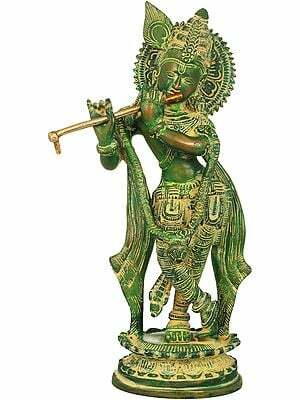 He has been cast wearing a two-fold majestic crown : a forepart and pots-like shaped top with a row of peacock feathers cresting. 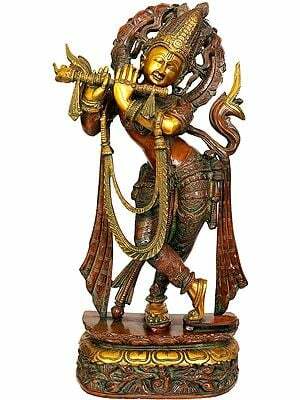 Apart, the halo, an element more characteristic to Vishnu’s iconography, has been so designed as to look like a part of the crown itself adding further majesty to his image. Vaishnava ‘tilaka’ – sacred mark, on the forehead, ‘kundalas’ – ear-ornaments, and large ‘Vaijayanti’ – garland of Parijat flowers, are other Vaishnava elements the image has been conceived with. 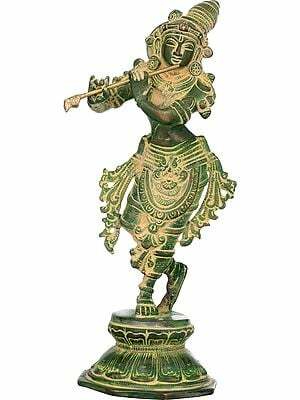 Gorgeous ‘antariya’ – lower wear, elaborate girdle and waist-band, and overall magnificence are more akin to Vaishnava imagery, though exceptional ornamentation and use of decorative laces unfurling on sides add to them some degree of ethnicity too. 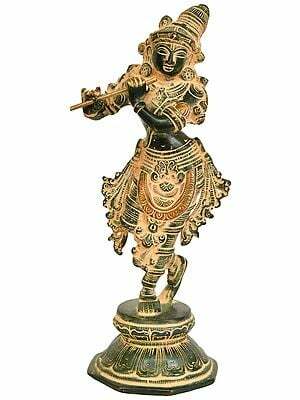 Lord Krishna’s statue with three curves, not merely the posture of legs but correspondingly the entire figure, along with the figure of the cow, has been installed on an oval ‘pitha’ – pedestal, consisting of a large lotus with two sets of petals, one upwards opening, and other, inverted, base-moulding adorned with bels – creeper motifs, and upper, plain. 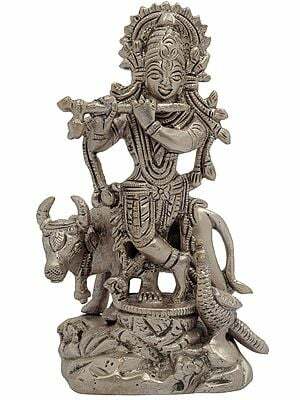 The cow with its tail collected inside its legs as when feeding its calf, and with face turned to him, reveals its complete submission. 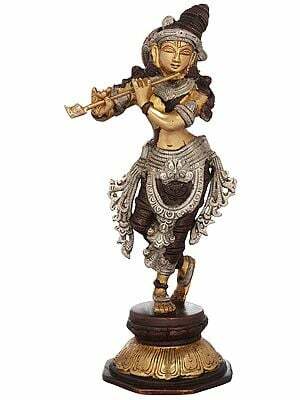 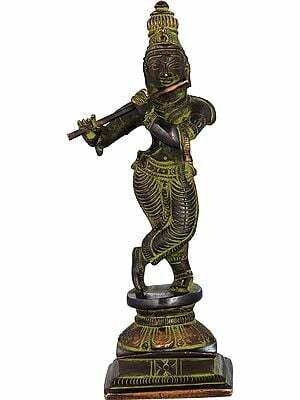 As indicates the height of its haunches, it has lowered its back to befittingly adjust along it Krishna’s figure. 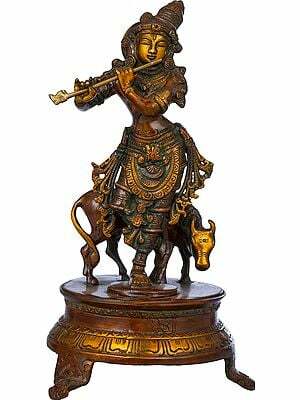 Beautifully saddled the cow has been as gorgeously ornamented as the image of its Lord. 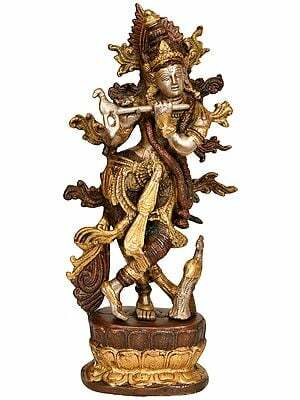 Adorned with a wide range of ornaments, every piece so strangely conceived and revealing divine lustre, gorgeous ‘antariya’ – lower wear, sashes and bands, around shoulders, waist and arms, Lord Krishna has been represented as playing on his flute though the extra-ordinary ornate character of the image seems to slightly affect the quantum of his absorption in it. 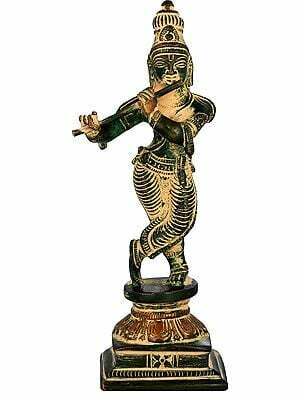 Fine execution, discovering forms : iconographic features and linear details, sensitive treatment of subject, perfect anatomical balance and well-assimilated parts impart to the statue unique artistic merit and rare distinction.